Santa Monica Press, 9781595800848, 336pp. 10,000 Steps a Day in L.A. is for urban adventurers with a passion for healthy living who are also eager to explore Los Angelesfrom its most legendary locations to its more hidden, unsung, and quirky sites. 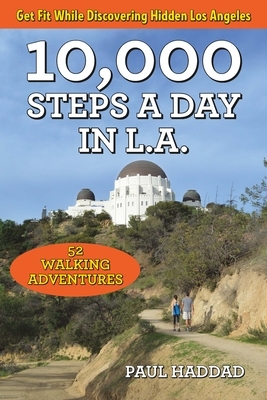 In this first-ever book to explore the 10,000-steps lifestyle in Los Angeles, author Paul Haddad takes readers on a journey through the city's streets, beaches, mountains, rivers, reservoirs, and parks. He includes 10,000-step walks from throughout the Southland, from Simi Valley to the South Bay, and Pasadena to Pacific Palisades. Paul Haddad is the author of High Fives, Pennant Drives, and Fernandomania: A Fan's History of the Los Angeles Dodgers' Glory Years 1977-1981. It was chosen as one of the top baseball books of 2012 by the Los Angeles Daily News and earned praise from the L.A. Times, Fox News, NBC News, Yahoo!, ESPN Radio, and CBS Radio. Born in Hollywood, Haddad has contributed essays about Los Angeles to the L.A. Times and the Huffington Post. When he is not writing books, he works as a television writer and executive producer.